Ever wondered what the outside world thinks about photographers? Face it you do live in your own world of observation, f-stops and fill flash – some words I have heard you use numerous times. Women mostly seek out photographers to photograph their weddings but rarely is the photographer the groom. By now I am sure you have worked out I am not a photographer – but I will defend myself and say I can take a good picture. I am married to the photographer, the light breather, the constant clicker and painful critic of his own images. 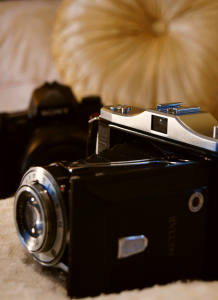 A constant stream of new cameras, dug out old cameras, ancient cameras are always on our bed. Not only does my hubby like to photograph things he likes to talk – meaning I have a constant talk radio show about software upgrades and new model releases. Our whole home is a buzz of photobia and I plan to name a growing number of house cats Leica, Hasselblad, Nikon, Canon, Holga and could I call a cat Lomo? I am undecided. I will have to name a dog Alpha. This way I can say those names with the same affection as my husband. Those hunks of plastic, metal and glass now lying on my bed don’t make my heart purr. Living in photobia you do glean a thing or two. All the banter with model names, letters and numbers go into the garbage disposal of my mind but I do feel I have a heightened sense of quality photography. The majority of women’s fashion magazines are not my idea of creative inspiring photography. I have seen one fashion shoot I have seen them all. Try the homemaking magazines the photographers show more originality in the food sections at times. This got me thinking. Where do mainstream everyday people with no personal link to “photobia” ever experience quality photography? Perhaps the one shot cover of a news paper at times. As I have lived with numerous photographs being flashed before my face of different photographers a sense of awareness has grown in me about, lighting, composition and exposure. I have learnt to look at photographs and see meaning. I can walk away from a black and white photograph of a 70yr old ballerina thinking about aging well, life’s experiences and be amazed at how beautiful she is. Flipping through a magazine leaves me wondering how much photoshop and colour enhancement was done here just to get one women to look like the women on the next page. What I am proposing to all those who live the photobia life is to share more and care less that people might think you crazy and artsy. Photography is a powerful medium but like with words on a page needs to be taught so it can be read. I realise I might have offended some fashion photographers here. Please know I am aware of the brief you need to adhere to when shooting for magazines. I feel that often the aim of the photo shoot to sell fashion is often too narrow for “experiments with creativity” as a magazine may put it. I believe there is an untapped well of creativity in fashion photographers as they all can’t work for the high end fashion magazines like Vogue. To the fashion photographers and all photographers please share more. I feel my life would be enriched by your art and believe others will be affected in the same way. Teach people how to “read” quality photography. If those hunks of photographic equipment on my bed are producing inspiring thought provoking images I am privileged to share a home, a bed and a few pets with them.